What reason could People In Charge possibly have for allowing, nay, encouraging this to happen? I mean aside from ratings and masochistic nostalgia for 2017? As we all know, these stricken visages were contorting in reaction to Dunaway reading out that the Oscar went to La La Land, then learning that Moonlight was actually the winner. This was due to a mix-up with the cards and general lack of common sense. And maybe some stage jitters. 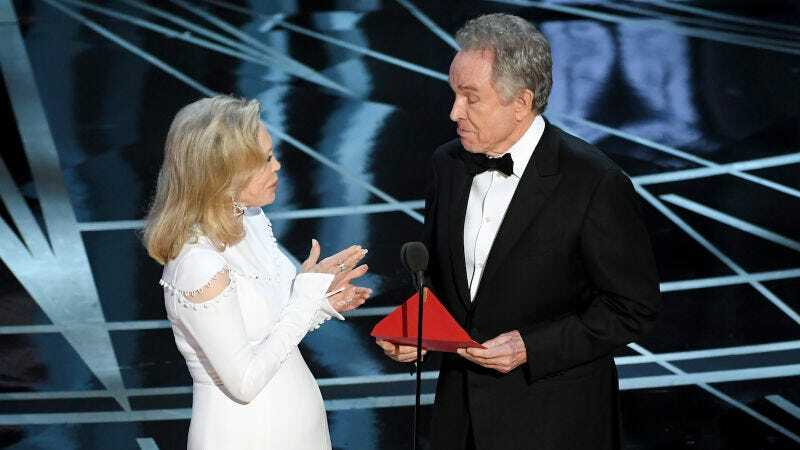 According to TMZ’s sources, Dunaway and Beatty appeared at the Dolby Theatre earlier today and rehearsed the best picture award scene. Dunaway reportedly said “presenting is better the second time around,” to which Beatty rejoined “The winner is Gone with the Wind.” It’s the sort of writing that makes people cringe and have a bad time, and this, more than anything else, is what has me convinced me that this story is genuine.